Photo booths offer a unique keepsake as well as interactive entertainment for your guests. Choose from an assortment of styles to fit the mood of your wedding. This is a true beauty! This booth is the original Auto-Photo Model 17 manufactured in 1968 that had a home at the San Jose Flea Market for the past 40 years. Dressed in black and white for a formal affair is a perfect addition to just about any venue. Imagine yourself sitting inside this beautifully restored original photo booth, selecting color or black and white and behaving like your true self. Don't worry; it is just you and the booth, no one will ever know. This used to be the case 50 years ago, but with digital technology all the images are now stored in the memory of the computer. This is a crowd pleaser! This photo booth is the original Auto-Photo Model 14 that had a home at San Jose Flea Marked for past 40 years. Completely restored to its original beauty. With its classic wood exterior, original artwork, vintage door and classic spinning chair you could easily transport yourself back to your youth. But don't dream too long, you might miss the poses! If you missed the shots, do not worry, just come back again! A stunning beauty! In our opinion, the most beautiful photo booth ever built. With only about a dozen of these booths remaining in the United Stated, we had no choice but to build our own. This photo booth is the replica of the original Auto-Photo Model 11 manufactured in 1958. The booth still retains the original look with a classic wood veneer, vintage doors and the spinning chair using the original parts from the Auto-Photo Model 14. Boardwalk photo booth is the TRUE original classic photo booth. This photo booth was originally build in 1974 and had a home on Santa Cruz Boardwalk until its retirement in Spring 2009. 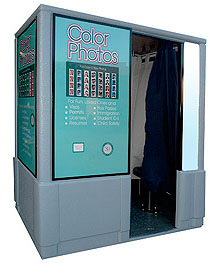 Originally this was a "chemical" photo booth producing the unforgettable 4-pose strip color photos. No, we did not purchase this Portrait Studio booth from Michael Jackson's Neverland Ranch, but it is the same model as the one on his ranch during the good old days. We made a few major changes to the booth, but we tried to keep the look and feel of the booth to resemble the original Portrait Studio booth. We replaced the old CRT 13 in. monitors with new 15 in. LCD monitors so that guests can see live images from inside of the booth. 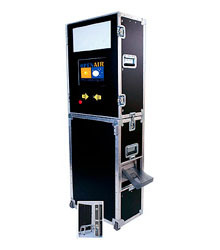 This is the largest and most spacious photo booth in our catalog. The booth will easily fit 3 to 4 people. Hollywood Photos photo booth is the "classic" style booth. The photobooth is fully enclosed and provides privacy for guests that want to "create" that unique pose. The only "classic" thing about this photobooth is the look. The images produced by the photobooth are high quality digital images printed onto glossy photo paper in less than 15 seconds by the latest high resolution digital printer.